Are you in the business of transporting food and other products that needs to stay chilled to stay fresh? Are you looking for a cost-effective and reliable way to keep your products fresh in transit? 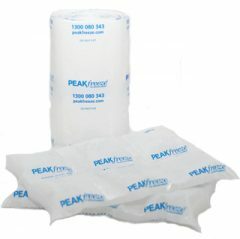 Peak Packaging is Australia’s trusted supplier of a wide range of high-quality ice replacement gel packs and pads at a low cost. Ice gel packs are revolutionising the product transportation industry for many reasons. Using Peakfreeze ice gel packs and ice replacement pads for shipping fresh foods is a no mess, cost effective and convenient option. 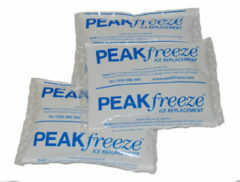 Peak Packaging’s Ice gel packs and ice replacement pads are a more favourable option over ice itself as it saves time and is more efficient at keeping produce colder for longer. Peakfreeze ice replacement gel packs and pads are manufactured in a facility with a certified Food Safety Program (HACCP), meaning you can be confident of the safety and quality of your produce. No matter what product you’re transporting – if it needs to be chilled, we have the quality products for the job. Stop using messy and quick-melting water when you can use our high-quality, pads and packs made for staying frozen for longer, so that your products will look as fresh when they are delivered as when you sent them off. We provide customers across Australia with affordable packaging solutions. From carry bags to carton liners, sit back, order yours online, and have it shipped to you. As the innovative fresh face of packaging, we continue to strive to disrupt the industry by supplying our customers with more efficient and cost-effective solutions for their needs. 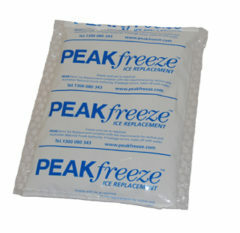 For ice replacement gel pads, frozen packs, dry ice packs, and gel freezer wraps, contact your trusted manufacturer and supplier, Peak Packaging. Got questions or enquiries? Our team would love to hear them! Contact the Peak Packaging head office during business hours or fill in the enquiry form below and one of our representatives will be in touch shortly. You can contact us on 1300 080 343 or by email at info@peakpackaging.com.au.